Diamonds come in all variety of colors. While the presence of some colors like pinks, blues, and yellows are more prized than others; however in white diamonds, the lack of color is what is mostly prized and sought after. In white diamonds, the color scale begins with the letter D (colorless) and continues through the alphabet to the letter Z (light yellow). Once the diamonds body color falls beyond the D-Z scale, it is then considered to be a “fancy color diamond” and its color is graded on a different color scale standards. In many cases, a diamonds color, or lack thereof, can be extremely subtle to detect with an untrained eye; however, it is in these subtle differences that a great deal of impact on a diamonds overall quality and price lies. Simply stated, clarity is the relative absence of inclusions and blemishes in diamonds. Because each diamond is exclusive and no two diamonds are ever alike; clarity characteristics play a big role in making each diamond not only unique but distinguishable from another. Most diamonds will have internal features called inclusions, and surface irregularities called blemishes. There are five factors that assist in determining a diamonds overall clarity and they are; size, number, position, nature, and relief (color). Diamonds which contain numerous or significant inclusions or blemishes will appear to be less brilliant because the flaws interfere and obstruct with the path of light through the diamond. In some cases, depending on the inclusion, some clarity characteristics can also affect the overall durability of the diamond. Therefore; it is best to select a diamond with the least amount of prominent inclusions. Cut denotes to two distinct characteristics of a diamond; its shape or style of cutting (Round Brilliant, Marquise, Princess…etc. ), and its overall superiority taking account its symmetry, measurements, proportions, and polish to determine how well a diamond can reflect light back to the viewing eye. A diamonds cutter sole purpose is to capitalize on and maximize the diamonds three optical effects: brilliance, which are flashes of white light reflected back to the viewer’s eye, dispersion or fire, which is the parting of light into spectral colors, and finally scintillation, which are the contrasting dark and bright flashes of light that alternate from facet to facet and attracts our eyes when the diamond is moved. Altogether, a well-cut well-balanced diamond is going to determine whether or not it sparkles, displays flaws, exhibits color, and so on, so one needs to consider the overall quality of the cut when making the purchase. A diamonds weight is measured in carats, a small unit of measurement equal to 200 milligrams. Each carat is divided into 100 points. Therefore, a half-carat stone may be referred to as a "50-pointer" or "50-points" in the market. Carat weight is the simplest of the 4 C's (Color, Clarity, Cut, and Carat) for a gemologist to determine due to the use of highly sophisticated and extremely sensitive measuring device. Diamonds range in all sizes from a fraction of a carat to numerous carats. All determining factors being equal, a diamonds price increases as its carat weight increases, because larger diamonds are rarer and more desirable; therefore, a single 2-carat diamond will cost much more than two 1-carat diamonds. Developed in the late 1950s early 1960s, the oval brilliant cut is a modified elliptical variation of the more common round brilliant cut. The oval cut was designed to conserve the diamond's proportions and its natural brilliance, while playing with the precious gemstone's symmetry and its dimensions. The oval cut diamond possesses beautiful brilliance and fire similar to a round diamond. The modern oval cut is a lively cut that reflects light radiantly. It's a wonderful choice for someone who loves the sparkle of the round brilliant, but desires a less common and more unique shape – classic with a little edge. The great advantage of an elongated oval shape is that it creates the optical illusion of a greater diamond size. It’s traditionally popular among women with small hands or short fingers; its shape adds an interesting twist to rings and accentuates the hand and fingers to create an elegant slender look. The width of the oval cut diamond varies based on personal preference, but oval cut diamonds are usually most pleasing at a 1.50 ratio (one and a half times as long as they are wide) or within the range of 1.35 to 1.60. This makes the outline elongated enough to be distinguished from a round, but not so long that it could be confused with a Marquise. Be cautious of' the ‘bow-tie effect' in oval cuts with a ratio greater than 1.50. A ‘bow tie effect’ is a dark bow tie shaped area across the center width of many fancy shapes prominently visible through the table; it’s a result of varying or improperly cut pavilion angles. An oval cut diamond should look fiery and bright, a 'lifeless' looking oval cut diamond indicates that the diamond's dimensions are asymmetrical and that its proportions were not met. It is best to avoid excessively deep or shallow stones and always opt for higher cut and symmetry grade. Although an oval cut is primarily designed to accentuate a diamond's sparkle, it will also complement and enhance the diamond's color and its clarity. Dating back to the late 1450s; the pear cut is a hybrid combination of a marquise and a round shape with a tapered point on one end. This cut is also referred to as ‘teardrop’ or ‘pendeloque’ cut and is admired and valued for it is one of most difficult shapes to cut. In a ring, a pear cut diamond is especially pleasing to a hand with small to average-length fingers. Similar to the round brilliant, the pear cut diamond embodies fantastic brilliance and sparkle beyond its unique and obvious beauty. The standard number of facets of a pear shaped diamond is 58, but depending on the cutter, it may have a varying number of pavilion (lower girdle) facets from 4, 6, 7, or 8. The optimal ratio for a pear-shaped diamond is about 1.60, within the range of approximately 1.50 to 1.70; this ensures that the outline possesses enough length to appear elegant. A Pear which is very short and wide (a ratio less than 1.30), or too long and narrow (a ratio over 2.00), may result in less brilliance and fire or may be difficult to properly set. Preferably, a pear shaped diamond should hold an excellent or very good symmetry. The point or tip should line up with its rounded end. The upper and lower curves on the right and left side of the diamond (shoulders and wings) must form uniform, symmetrical curves, with no straight edges. The tip or point of this shape must be protected as it is most vulnerable to damage such as chipping. Flaws such as extra facets, naturals, and other inclusions (internal and surface reaching) may well be located there. Pear cut diamonds are also susceptible to the ‘bow tie effect’. It is a dark bow tie shaped area across the center width of many fancy shapes prominently visible through the table; it’s a result of varying or improperly cut pavilion angles. Be aware that pear cuts can exhibit a diamonds color and inclusions more than other fancy shapes; therefore always opt for a color of I or higher and a clarity of SI1 or higher. The emerald cut is a step cut with angled corners and rows of crown and pavilion facets that run parallel to the girdle. It is most commonly used on square or rectangular diamonds and is an extremely elegant style known for its beauty and precision. This style of cutting was originally used only on emeralds, hence the name, but quickly became popular showcasing high quality, high colored diamonds. While it lacks the brilliance of a diamond cut with triangular and kite-shaped facets, it more than makes up for it in its clarity and color, and also tends to have broader, more dramatic flashes of light. An emerald cut diamond does not ‘sparkle’ but actually produces a hall-of-mirrors effect, combined with the interplay of light and dark planes; it emits a remarkably beautiful look. The points and corners of an emerald cut must always be protected as they are most vulnerable to damage such as chipping. Flaws such as extra facets, naturals, and other inclusions (internal and surface reaching) may well be located there and may reflect in the center of the table. When selecting an emerald-cut diamond, good color and clarity is vital – in fact, you will rarely find one in lower grades. That is because inclusions and body color are much more obvious in this shape. When purchasing an emerald cut diamond, it's important to select the highest grade stone you can; because of the 'openness' of the cut, flaws, color, and poor cut may be more evident (obvious) to the naked eye than in a brilliant cut. Always opt for a color of H or higher and a clarity of VS2 or higher. The cushion cut diamond is an antique cut that embodies a timeless classic and romantic appeal. Prior to use of electricity, the cushion cut was better known as the ‘candlelight diamond’ or ‘pillow cut diamond’ as it was precisely designed to show off its brilliance against candlelight. The cushion cut is a fusion between old-fashioned diamond cutting styles, including the antique cut and the old mine cut, and more modern diamond cuts, such as the oval cut. Recently, the cushion cut diamond has since been refined and improved to achieve better symmetry and proportions in order to fit modern standards. Standards for cushion cut diamonds vary widely and more than with most contemporary cuts, personal taste will dictate choice. So you will easily find Cushion cuts that are nearly square, long rectangles, with varying facet arrangements and table sizes. When shopping for cushion cut diamonds, correct proportions, an even girdle, and a good symmetry are vital. A well-balanced cushion cut diamond will have straight clean lines, properly placed and symmetrical facets, and a fiery appeal. A disproportionate, asymmetrical cushion cut diamond will appear muted, lopsided and dark. Generally, the cushion cut embodies a softer appearance and how it reflects multicolor light is a bit more antiquated than any other cut. It is less brilliant than the round brilliant cut, but well-proportioned cushion cut diamonds often emit better and more desirable fire which makes this cut a perfect fit for prized colored diamonds. Since the cushion cut diamond is fitted with wide facets, any internal characteristics present within the diamond might be very apparent. Therefore, it is important to choose a high quality diamond with a high clarity grade. The variations in facet patterns may also enable the viewer to perceive color more easily, but this should be judged on a stone by stone basis, and some may enjoy more color in the stone, especially with antique styled cushions. If you are looking for a diamond cut to stand out, consider a marquise cut diamond. A fancy shape by most standards, the marquise cut diamond can be characterized as a ‘boat-shaped’ brilliant stone. Featuring an elongated curved shape with two pointed ends and fitted with the largest crown surface areas of any diamond shape, the marquise cut diamond can often look larger than other shapes of the same carat weight making it an excellent choice when trying to maximize your budget. Like the oval and pear cut, the marquise cut also provides an elegant compliment to any wearers hand by making the finger appear slimmer and longer. The standard number of facets is 58, but can have a varying number of pavilion (lower girdle) main facets ranging from 4, 6, or 8. The pointed ends of a marquise cut must always be protected as they are most vulnerable to damage such as chipping. Flaws such as extra facets, naturals, and other inclusions (internal and surface reaching) may well be located there and may reflect in the center of the table. Like most fancy cuts, the marquise cut is also susceptible to the ‘bow tie effect’. A dark bow tie shaped area across the center width prominently visible through the table; it’s a result of varying or improperly cut pavilion angles. Usually, the marquise diamond is cut to a 2.00 ratio (twice as long as wide), or approximate range of 1.75 to 2.25. This ratio is ideal and gives distinct length and elegance, whilst providing a good balance of width that is pleasing to the eye. A stone with a ratio of less than 1.50 will appear short, wide and dark, and a stone with ratio of over 2.50 will appear long and thin, may look lifeless, lack brilliance and be difficult to properly set. Personal preference will always dictate the width of a desired marquise cut. Proportion and symmetry is very important in marquise cuts. The two end points must align with each other, and the right and left sides should be equal. Depending on the quality of the cut, marquise cuts may show more color and inclusions than other brilliant cuts. Inclusions may be easily seen in the center (belly) facets, which are larger than the pointed end facets where inclusions are easily hidden. For this reason, excellent or very good symmetry and a clarity of SI1 or higher is strongly recommended. The princess cut is a square or a rectangular brilliant cut that was developed in the late 1970’s. Princess cuts surpass round brilliants in yield, retaining up to 75 percent of the rough from which they’re cut from. Their angular shape and considerable brilliant have made them extremely popular alternatives to the traditional rounds. This cut is extremely popular in modern jewelry designs that call for either channel settings or invisible settings because of their straight edges allowing them to be set against and alongside each other without any gaps. Of all the fancy cuts, the princess cut diamond is by far the most popular fancy shape and still continues to grow in popularity and demand. Despite their popularity, princess cuts tend to have a lower price-per-carat than the traditional round brilliant. Unlike its top competitor, the round brilliant diamond, the cutting style and cutting quality for a princess cut diamond can vary from one cutter to another, therefore; this cut can uniquely present a wide array of face up appearances from broader flashes of light to pinpoint type sparkle (depending on the individuals preference), therefore; it’s important to never opt on cut quality. Cut will also affect the diamonds color in face up appearance. Avoid princess cut diamonds that have a visible yellow tint (J color and lower). In round diamonds, J and K color graded stones can appear near colorless. However, in the case of princess cut diamonds, the lower the color, the more prominent the color will appear, its best to opt for a stone with an I color or higher. A princess cut diamond must always be set in a four prong setting to protect its four corners which are the most vulnerable to damage such as chipping. Since these corners were near the outer edge of the rough stone; flaws such as extra facets, naturals, and other inclusions (internal and surface reaching) may well be located there. Because of its brilliance, princess cuts allow the diamonds inclusions to be less visible to the naked eye. Please note that internal inclusions do not propose a risk to the stones durability as surface reaching inclusions do. Accounting for more than 75% of diamonds sold globally, the round brilliant cut is the most popular and most sought after diamond shape. It is also the most 'brilliant' of all cuts – cutters now use advanced theories of light behavior and precise mathematical calculations to optimize the fire of a round diamond. The round brilliant cut diamond represents the highest advances in diamond cutting, maximizing fire and brilliance by maximizing the amount of light entering and reflecting off of the diamond’s crown. Round brilliant cut diamonds are priced more (25% - 40%) on a per carat basis than fancy shapes for the following reasons; the demand for round diamonds is extremely high, and the yield is relatively low – more of the rough stone is lost in the cutting process therefore, the cost of each carat retained is higher. A well-proportioned round cut diamond can be mounted into virtually any setting. Since the round cut is designed to be symmetrical and proportional, a round cut diamond will have no problem fitting into a variety of stetting designs such as a prong setting, a channel setting, or bezel setting. Since a round cut diamond consists of strategically placed facets designed to maximize the diamond's brilliance and its overall appeal, a prong setting, which leaves most of the diamond's surface exposed, will nicely complement and help enhance the precious gemstone's natural sparkle. For the round brilliant diamond, selecting the highest quality cut you can comfortably afford is important; ‘Ideal’, ‘Signature Ideal’ and ‘Hearts and Arrows’ are the perfect choice and will guarantee impeccable brilliance and a stone full of life. Well-cut round brilliant diamonds will typically disguise their color and inclusions better than poorly cut stones of the same shape. The brighter the cut, the less color and inclusions you will see from the face-up view. Created in 1977 by Henry Grossbard, the radiant cut was designed with brilliance in mind, hence its name. The radiant cut diamond was designed to uphold the beauty of each different type of diamond, from colored to colorless, while still fashioning something new and altogether different from anything available at the time. It combines two diamond cutting styles; the emerald cut (step cut) and the round brilliant cut style, to create a non-traditional, yet brilliant, diamond. The radiant shape is similar to that of an emerald cut, but is fashioned with a facet arrangement that gives it brilliance comparable to that of a round brilliant diamond. Thus the radiant cut allows buyers to opt for exquisitely shaped rectangular diamonds without having to settle for the sought after brilliance effect that was only once achieved by the round brilliant cut. Like the princess cut diamond, as a result of their different design, the radiant cut diamond will generally look smaller than other diamond shapes of the same weight. Radiant cuts have angled corners. Because of this, radiant cuts lack the setting issues that are present in other fancy shapes equipped with sharp corners or points (tips) which require extra care. Radiant cut diamonds can be cut to a square outline with a ratio ranging from1.00 to 1.05, or for a rectangle outline with a ratio ranging from 1.20 to 1.40; personal preference will always dictate the width desired. In longer more rectangular radiant cuts, the ‘bow tie effect’ may be present. A dark bow tie shaped area across the center width prominently visible through the table; it’s a result of varying or improperly cut pavilion angles. The angles and proportions of the radiant cut were all skillfully calculated to maximize the fire of the diamond. The corners of the diamond are cropped in order to allow more brilliance and light dispersion. Popular among fancy colored diamonds, the nature of this cut benefits in the concentration of color, and will sometimes push a light yellow diamond in the S-Z range into the fancy yellow category. The heart brilliant cut, an age-old symbol of love and romance, is the ideal way to balance brilliance and fire with a unique cut. It is essentially a pear shaped diamond with a cleft at the top center. Considered to be a highly esteemed fancy diamond shape, the heart shaped diamond is extremely hard to master and demands tremendous expertise and skill. Crafting a heart shaped diamond out of a rough diamond involves meticulous symmetry and precision spreading over several planes and facets. In a heart shaped diamond, quality of cut is everything. It is essential that the two halves of the heart are identical, the cleft (between the two lobes) must be sharp and distinct, and the wings (the sides as they curve down to the point) must have a slightly rounded shape. Avoid heart shaped diamonds which are too flat or too deep; a flat diamond will dull the brilliance of the stone, and a deep stone will be dark and hard to set. Heart cut diamonds are also susceptible to the ‘bow tie effect’. It is a dark bow tie shaped area across the center width of many fancy shapes prominently visible through the table; it’s a result of varying or improperly cut pavilion angles. According to gemologists, the ideal length to width ratio of a heart shaped diamond should be 1 to 1 in order to exhibit the best possible brilliance and fire. In general, heart shaped diamonds appear to be smaller when compared to other diamonds of the same carat weight. Since the heart shape is much more difficult to perceive in smaller diamonds, especially after they are set, heart shaped diamonds less than .50 carats are not a good choice. A heart cut diamond must always be set in a setting to protect its point or tip which is the most vulnerable to damage such as chipping. Since this corner was near the outer edge of the rough stone; flaws such as extra facets, naturals, and other inclusions (internal and surface reaching) may well be located there. Color can be more visible in hearts, especially in the lobe areas. Therefore; it’s extremely important to pay attention to quality and select the highest cut grade you can afford. Evoking an art deco feel from the 1920s and ‘30s and often referred to as the ‘square emerald cut’, the asscher cut diamond was developed in 1902 by the Asscher Brothers of Holland. It is a stepped square cut with cropped corners and is an excellent choice for the fashion-forward woman desiring a dramatic look. This diamond shape is a forerunner to the emerald cut diamond as they are both similar to one another, but the asscher cut is a square shape with large step facets, a higher crown and much smaller table. Also, because of its proportions and because it possess an extra row of facets on top and bottom, it typically has more light reflection and fire than an emerald shaped diamond. A well cut asscher will appear to have aligned and even squares as you look down through the table, this is a signature result of proper positioning of the pavilion facets. At first glance and because of the cropped corners, an asscher cut diamond appears to be almost octagonal. The classic asscher cut diamond is a square with a length to width ratio of 1.00; however on rare occasions they can be found in slightly rectangular shapes as well. A properly proportioned asscher cut diamond embodies a bright, shiny, and clear appearance. Like the emerald cut diamond, asscher cut diamonds provide you the ability to see all the way through the stone. Likewise, because of the large open facets, body color is easier to be perceived in an asscher cut diamond, especially in its corners. Although the price for an asscher cut diamond with lower color or clarity grade can be enticing, and since color and inclusions are obvious to the naked eye with this cut, it is important to obtain one of exceptionally high clarity and color of H or higher. Carat weight specifically refers to a gemstones (diamond) weight. The carat is a unit of mass equaling 0.2 grams or 200 mg, it is the unit used to measure gemstones, diamonds, and pearls. Carat weight is measured to three decimal points and rounded to the nearest hundredth. It is dividable into one hundred points. For example; 0.74 point diamond weighs 0.74 carats. Carat weight is unrelated to the similar sounding karat, which refers to gold's purity. Diamonds range in all sizes; from a fraction of a carat to several or many carats. All other factors such as cut, color, and clarity being equal, a diamonds price increases with its carat weight, because larger diamonds are rarer and more desirable. Fewer than one in one million mined rough stones are large enough to produce a finished 1-carat diamond. So, as carat weight increases, one will typically pay more not only in total, but on a price-per-carat basis as well. It’s important to note that carat weight alone will not accurately reflect a diamond's size, for that, the gemstones height and depth must be considered as well. Gemstones of the same carat weight can vary in actual size. Diamond pricing is determined by carat weight, and broken down in half-carat increments – also known as price point breaks. Therefore, assuming factors like polish, cut and clarity are equal; a diamond weighing exactly one carat (1.00 ct.) will cost more than a diamond weighing slightly less than one carat (0.95 ct.). Although visually, they are difficult to distinguish; a smaller carat weight diamond may have a diameter equal to that of a heavier diamond, making it appear the same carat size when viewed from above. An increase in carat weight does not produce the same increase in millimeter diameter (size). For example, there is a 25% increase in actual carat weight from 1.00 carats to 1.25 carats but less than 8% increase in diameter (6.5 to 7.0 mm). This concept, along with the increased price per carat, explains why prices increase dramatically in order to get noticeably bigger millimeter size. If size is significant to you, focus on the diamonds physical measurements as opposed to carat weight alone. Diamonds that appear large for their weight may have diminished fire and brilliance, therefore, always insist on a great cut. Diamond professionals can use mathematical formulas to estimate the weight of a mounted diamond for both round and fancy shapes. Because round brilliant cuts follow specific standards, a skilled professional can closely estimate of the carat weight of the stone based on the stone's measurements – fancy shapes aren’t always as accurate because of the adjustment factors. With careful measurements, calculations, and adjustments, a skilled professional can estimate a diamonds weight within a 10 percent margin error. For example, if a stone is estimated to weigh 0.90 ct. might actually weigh between 0.80 ct. and 1.00 ct. – it’s important to remember an estimate is not an exact carat weight measure therefore, price points may extremely vary. Second to cut, a diamonds color is the second most important factor to consider, as it can be noticeable to the naked eye. Many diamonds that look colorless actually possess a small amount of color – usually yellow or brown. Therefore, when jewelers and buyers speak of a diamond's color, they are usually referring to the presence or absence of color in white diamonds. Although a diamonds body color is a result of its chemical composition and does not change, a skilled jeweler can either enhance or mute the color given the right setting. In actuality, most diamonds in the market range from colorless to nearly colorless to light yellow or brown. This is known as the D-Z color scale also known as the normal color range, with D being colorless and Z being light yellow. Diamonds beyond the normal color range come in startling array of other colors. In fact, they come in just about every color of the rainbow from deep yellows as well as a range of pinks, oranges, blues, and greens. These diamonds are known as fancy colored diamonds and their color grade is assessed differently. A diamond's assessed color reflects greatly in its price value, therefore, the whiter a diamond's color is, ranging from D-J, the greater its value. Keep in mind fancy color diamonds are an exception to this rule; certain colors like reds and untreated blues are extremely rare and extremely expensive, the stronger the color saturation is, the greater the price. Although individuals vary in their capacity to detect color differences, most people prefer colorless (D-F) and near colorless (G-I) diamonds, or at least a color that is not very detectable to the untrained eye. Diamonds that fall in the D-F range can be the most visually captivating diamonds and naturally, because of their rarity and desirability, they are also among the most valuable. Fortunately, anyone can still find a very beautiful diamond. Diamonds in the G-J range show virtually no color to the untrained viewing eye. And while a very faint hint of yellow might be apparent, skilled jewelers can often minimize the appearance of color by carefully selecting the right jewelry piece in which to mount the diamond in. For their price, G-J diamonds offer a wonderful deal and a stunning charm. Diamonds in the K-Z color range will reflect a very faint to light yellow body color, however, a greatly cut diamond will achieve exquisite heights of brilliance, fire, and appeal for anyone desiring a beautiful warmer sparkle. Fluorescence is a glowing effect that is seen in many diamonds when they are exposed to ultraviolet (UV) light. Of the diamonds that do fluoresce, do so in fluctuating strengths of blue (faint, medium, strong, and very strong); however, diamonds can fluoresce in almost any color but blue is the most common. Under most lighting conditions fluorescence is not detectable to the eye. Throughout the diamond industry the term “cut” is fairly interchangeable and possess two meanings. One way “cut” is used is to describe the general cutting style or shape of the diamond, an example being “cushion cut” diamond. The second way “cut” is used is to describe the overall cut quality of the diamond which affects its reflective qualities and overall brilliance – this encompasses the diamond's overall proportions, symmetry and polish. Of the four C’s; color, clarity, cut, and carat, cut bears the most importance of the four. A diamond’s cut is the result of the skill and craftsmanship of a master cutter; true craftsmen unveil the hidden beauty of a diamond in the rough – the beauty of a diamond depends more on cut than any other factor. An excellent cut diamond will reveal exceptional quality regardless of color or clarity. How a diamond reveals and reflects its beauty is solely determined by its ability to play with light. However very difficult to measure and analyze, a diamonds quality of cut will resound in its three optical effects: brilliance, which are flashes of white light reflecting from the surface and the inside of a polished diamond, dispersion or fire, which is the parting of light into spectral colors or flashes of color, and finally scintillation, which are the contrasting dark and bright flashes of light that alternate from facet to facet and attracts our eyes when the diamond or the light source is moved. As light strikes a diamond, a small percentage of the light immediately reflects off the surface as glare. Depending on the quality cut of the diamond, the remaining percentage of light that enters through the crown can either reflect through and back out lively or escape through the pavilion facets (lower girdle) of the diamond. If the diamond cut is too thin or shallow, the light entering through the crown strikes the pavilion facets (lower girdle facets) at a low angle passing through the facets and escaping through the bottom of the diamond. Because of this, shallow cut diamonds will appear to be muted, dull, and almost see-through as if looking through a piece of glass. If the diamond cut is too deep, the light entering through the crown strikes the first pavilion facet (lower girdle facet) at a sharp angle enough to reflect to the second pavilion facet. Unfortunately, the light strikes the second pavilion facet at a low angle, causing the light to pass through (leak out) the facet escaping through the bottom of the diamond. Because of this, deep cut diamonds will reflect some light but will mostly appear to be dark and grey. In a well-cut well-proportioned diamond, the light entering through the crown strikes each pavilion facet at an angle allowing most of the light to reflect back out of the crown to be perceived by the viewing eye as lively fire. A well-cut diamond will have each facet properly placed, aligned, and angled in order to maximize the amount of light reflected back out of the crown of the diamond to the observer’s eye. This reflected light is perceived to be as scintillation, fire and brilliance. Therefore, in order to maximize on the potential of a diamonds beauty and appeal; it is important to invest in a good quality cut diamond. Because of how diamonds form, deep within the earth and under extreme heat and pressure; virtually all diamonds have unique clarity characteristics, much like a fingerprint or a birthmark, small imperfections on a diamonds surface called blemishes, or inside the diamond called inclusions. There are many different types of inclusions but they all fall under one of two classifications; internal inclusions or surface reaching inclusions. Inclusions are either completely enclosed inside the diamond (internal) or they break out of the stone through its surface (surface reaching); surface reaching inclusions will not only effect clarity, but may also have a noticeable and negative effect on the durability of the diamond over time. For example: a diamond with a large surface reaching inclusion such as a cavity (crack) located on its upper girdle facet can present a durability problem because a solid bump can make the cavity bigger. The position of an inclusion can affect the overall brilliance of a diamond, its ability to distribute light evenly, and how easily the inclusion can be seen. Diamond cutters make a conscience effort and take extra precautionary step when cutting a stone so that inclusions, especially dark crystals, are not visible through the table of a finished diamond. The ideal alignment for any inclusion is to be positioned under a bezel facet or near the upper girdle facets where the inclusion is much harder to be seen or found. Clarity refers to the relative absence of inclusions and blemishes in a diamond. Clarity characteristics and blemishes play a big role in making each diamond not only unique but distinguishable and easy to identify from another. There are five factors that are taken into account when determining a diamonds overall clarity and they are; size, number, position, nature, and relief (color) visible under 10x (power) magnification. Flawless (FL): No visible inclusions or blemishes at 10x magnification – extremely rare diamonds. Internally Flawless (IF): Only minor surface blemishes present under 10x magnification and no internal or surface reaching inclusions. Blemishes can be polished and removed to give the diamond a Flawless (FL) clarity grade. Very, Very Slightly Included (VVS1/VVS2): Contain minute inclusions difficult to find at 10x magnification. VVS1 inclusions are typically only visible from the pavilion, while VVS2 inclusions are visible from the crown. The inclusions are invisible to the eye and appear identical to the higher grades unless viewed under 10x magnification by a skilled grader or gemologist. Very Slightly Included (VS1/VS2): Contain minor inclusions that range from difficult (VS1) to somewhat easy (VS2) to find at 10x magnification. VS1 Inclusions are not visible to the naked eye and a small percentage of observers can detect VS2 inclusions with the naked eye. Slightly Included (SI1/SI2): Contain noticeable inclusions that are easy (SI1) or very easy (SI2) to see under 10x magnification. Included (I1/I2/I3): Contain obvious inclusions that are obvious to see under 10x magnification. I2-I3 diamonds have prominent inclusions may even affect the diamond's durability. While flawless diamonds are the rarest and most highly prized, a diamond does not have to be flawless to be striking. In fact, the most popular clarity ranges are the VS1-VS2 and SI1-SI2. Diamonds in these clarity ranges can appear flawless and eye-clean to the naked eye, and are a fraction of the price of a truly flawless diamond. Frequently, customers will opt for these clarity ranges in exchange for a higher cut or color grade. This combination often results in a stunning, sparkling diamond with imperfections visible only upon close inspection. The GIA Diamond Grading Report includes an assessment of the 4Cs – Color, Clarity, Cut, and Carat Weight – along with a plotted diagram of its clarity characteristics and a graphic representation of the diamond’s proportions. GIA issues the Diamond Grading Report for loose natural diamonds only, weighing 0.15 carats or more. 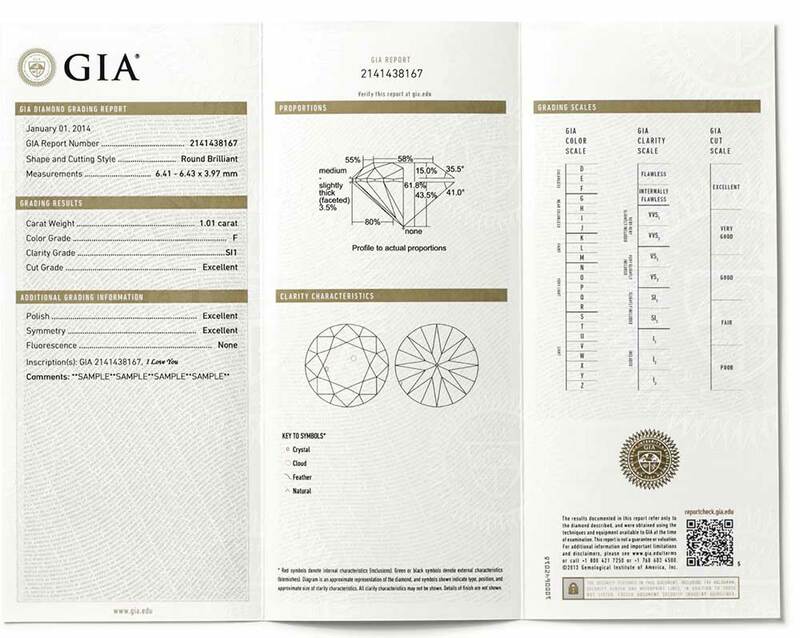 For standard round brilliant cut diamonds falling in the D-to-Z color range, the report also includes a GIA Cut grade. Date diamond was examined by GIA. Unique GIA report number registered in GIA’s extensive global database. The outline of the diamond (shape) and the pattern of the facet arrangement (cutting style). Diamond dimensions listed as “minimum diameter – maximum diameter x depth” for round diamonds and “length x width x depth” for fancy-shaped diamonds. Weight given in carats, recorded to the nearest hundredth of a carat. One carat is equal to 1/5 of a gram. The absence of color ranging from colorless to light yellow or brown when compared to GIA Master Color Comparison Diamonds. Graded on a D-to-Z scale. If “*” appears next to the color grade, a color treatment was detected. The relative absence of inclusions and blemishes. Graded on a scale from Flawless to Included based on size, nature, number, position, and relief of characteristics visible under 10x magnification. For standard, D-to-Z color, round brilliant diamonds. Cut grade incorporates the aspects of face-up appearance, design, and craftsmanship. Graded on a scale from Excellent to Poor. Smoothness of the diamond’s surface, assessed on a scale ranging from Excellent to Poor. Exactness of the diamond’s outline, and the shape, placement, and alignment of its facets, assessed on a scale ranging from Excellent to Poor. Strength and color of the diamond when viewed under long-wave ultraviolet light. A fluorescence description of “none” represents a range of fluorescence from Indiscernible to Very Faint. Used for identification purposes. Any text, symbols, logos, or a unique GIA report number inscribed on the diamond’s girdle. Additional identifying characteristics or features that are not otherwise represented on the report. If a treatment is detected, such as laser drilling, it would be described here. Graphic profile representation of the diamond’s actual proportions. Approximates the shape and cutting style of the diamond. Symbols indicate the type or nature, position, and the approximate size of a clarity characteristic. Lists the characteristics and symbols shown on the plotting diagram, if present. Illustrates the GIA Color grades and their relative positions in the GIA Diamond Color Grading System. Illustrates the GIA Clarity grades and their relative positions in the GIA Diamond Clarity Grading System. Micro printing, security screens, watermarks ,a two-dimensional barcode, a hologram, and sheet numbering safeguard report integrity and facilitate document authentication. A two-dimensional barcode that, when scanned, verifies data on the report against the GIA database. Formed deep within the Earth millions of years ago; natural fancy colored diamonds are true miracles of nature. These diamonds exude warmth and sophistication not offered by any other gemstone and represents the pinnacle of personal expression and individuality. These precious one of a kind gems are rare and renowned for their beauty, encompassing an endless array of colors including pinks, yellows, oranges, greens, blues, and the rarest of all reds. In fancy colored diamonds, color is everything. Colored diamonds obtain their color from impurities (chemical composition) found in nature that make their way into its crystal structure. Different impurities in different concentrations will produce different colors. Nevertheless, understanding and describing color can present a challenge, and evaluating the actual body color of a diamond by visual means requires true mastery and comprehension of what color truly is. Color is a continuum that can be defined and described in terms of three attributes; hue, tone, and saturation. Hue is the basic impression of a color; it is the shade of color that is present in the diamond for example; red, blue, green and so on. Tone is the relative amount of lightness of darkness in a color. Saturation is the strength or pureness of a color. Together, these three attributes are assessed to grant the colored diamond a specific grade on the color scale. It’s important to note that as saturation drops, cool hues like blue, green, and violet become grayish and warm hues like red, yellow, and orange become brownish. As saturation levels increase, grayish and brownish components gradually diminish until they are no longer visible. Most natural colored diamonds exhibit combinations of multiple colors that contribute to the overall appearance (hue) of the diamond. Any secondary color that is found in addition to the main color is known as a modifier (secondary hue) – it’s not uncommon for natural fancy colored diamond to possess more than one modifying color. Once assessed, secondary hues are always listed before the main diamond color. For example; a yellow diamond may have a green secondary which will subsequently be graded as "Fancy Greenish Yellow." A blue diamond may have a grey secondary color which will be graded as "Fancy Greyish Blue" and so on. Secondary hues are an important component to consider when purchasing a natural fancy colored diamond for they not only impact the overall hue of the fancy color but can significantly decrease or increase the cost of a diamond. It is important to note that not every diamond color appears in all intensity levels. For example; Orange diamonds cannot be found in Faint, Very Light, or Light intensities, they only appear in Fancy Light, Fancy, Fancy Intense, Fancy Dark, Fancy Deep, and Fancy Vivid. Price should also not be confused with value. All natural fancy colored diamonds are valuable, some are just more unique than others and are therefore, more valuable. Because there are no set prices for natural fancy colored diamonds as the Rappaport pricing chart for D-Z colored diamonds, pricing may vary considerably from one vendor to the next. A colored diamonds cost is determined by a number of factors; rarity of color, color intensity and uniformity, and size – the most important being the face up appearance of the overall color. As a general rule, common colors will lower the cost of the diamond. These common colors include gray, brown, and yellow. On the other hand, other colors which occur much less frequently in nature are far more expensive. Some of these colors include pink, blue, green, purple and orange. The most expensive and rarest color of all is red and may be modified by the presence of brown or purple. Modifying or secondary hues can also affect the rarity and price factor of a natural fancy colored diamond. For example; a “Fancy Greenish Blue” diamond will cost more per carat than a “Fancy Greyish Blue” diamond, simply because green is a far less common color in nature. Natural fancy colored diamonds vary in color saturation and strength from faint to fancy vivid color. Just a slight shift in color intensity can cause a natural fancy colored diamond to become significantly more expansive and valuable. Strength of color is one of the most important factors in determining the value of a natural fancy color diamond. The value of a natural fancy colored diamond typically increases with the intensity of the most prominent hue within the diamond. Most colored diamond reports also define how well the color and intensity is distributed throughout the stone. A diamond certificate will specify “even” or “uneven” according to the percentage of the color distribution. Needless to say, colored diamonds which are classified as “even” will cost more per carat. Unlike colorless diamonds (D-Z Scale), with natural fancy colored diamonds, it is not rare for a cutter to sacrifice weight for color. Indeed, it is often possible to strengthen the intensity of the color and the overall appearance of the diamond by cutting it. It is very important to note that small shifts in quality and size can make incredible differences in value. As the size of the diamond increases, the price will increase significantly. Natural fancy colored diamonds weighing two carats or more will sell for far more per carat than one carat diamonds. The price of a natural fancy colored diamond tends to increase exponentially as the size increases.